Dynamic Mechanical Analysis determines elastic modulus (or storage modulus, G'), viscous modulus (or loss modulus, G'') and damping coefficient (Tan D) as a function of temperature, frequency or time. Results are typically provided as a graphical plot of G', G'', and Tan D versus temperature. DMA identifies transition regions in plastics, such as the glass transition, and may be used for quality control or product development. DMA can recognize small transition regions that are beyond the resolution of DSC (Differential Scanning Calorimetry). The test specimen is clamped between the movable and stationary fixtures, and then enclosed in the thermal chamber. 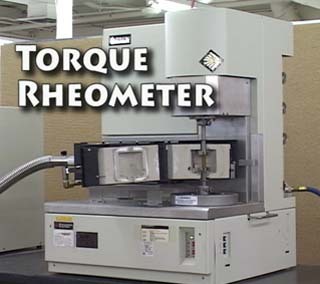 Frequency, amplitude, and a temperature range appropriate for the material are input. 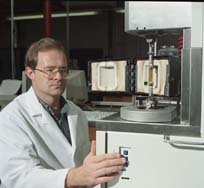 The Analyzer applies torsional oscillation to the test sample while slowly moving through the specified temperature range. Test specimens are typically 56 x 13 x 3 mm, cut from the center section of an ASTM Type I tensile bar, or an ISO multipurpose test specimen. The complex modulus is the complex response of the material to an applied strain (or stress) and is, in simplistic terms, the vector sum of the storage (Elastic) G’ and loss (viscous) G’’ components. It is important when reporting Tg by DMA to specify how the Tg was determined because the difference between the different techniques can vary as much as 25°C. Tg by DMA is often about 10°C higher than DSC Tg.